Delightful and low set, this crystal menorah shines with the light of the candles of Hanukkah, and creates a sparkling sight in the 8 nights of the holiday. Well designed both for stability and style, this is truly the perfect choice. This tasteful Hanukkah menorah is uniquely low set, on a pair of nearly flat feet that hold the modest but stylish menora. Made of glistening high quality crystal, this piece of judaica will truly show off the holiday candles glimmering in the darkness of the night each evening of Chanukah. When you light candles on this menorah, the flames will be able to gleam off of every surface of the menorah creating a beautiful sight of crystal and candlelight. The base features a small metal embellishment on the design to complete the perfection of the design. 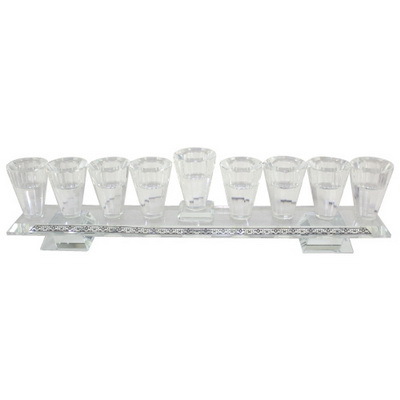 Making a wonderful gift, this menorah also is a great choice for your own Hanukkah. If it is for a gift, give in for Hanukkah, weddings, bar mitzvas or bat mitzvas, or even an anniversary around Hanukkah time.